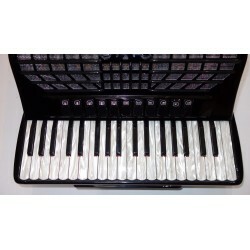 This is a 4 voice compact double cassotto Scottish musette in mint ondition throughout. 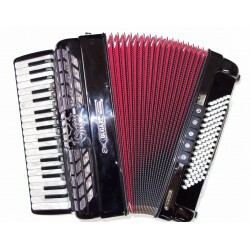 Three voice Scottish musette tuning plus basson reeds, it is a very versatile instrument suitable for all styles of music. 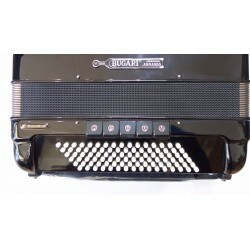 Also equipped with Blueline Midi with bellows expression and internal microphones, this is a truly professional accordion from world respected manufacturer Bugari Armando. Worth £8500 new, this Accordianis being offered for sale at this amazing price. • Black sparkle finish with pearloid keys buttons and red/black bellows.